Larry J. Sabato's Crystal Ball » A TROUBLING INDICATOR FOR BOTH PARTIES? A TROUBLING INDICATOR FOR BOTH PARTIES? Virtually every leading political indicator points to a midterm election this November that could range anywhere from difficult to disastrous for Democrats. The nation’s high unemployment rate, the declining approval ratings for President Barack Obama, and the Democrats’ lingering deficit in the generic congressional ballot all paint a dark picture for the ruling party. And now, it appears, the Republicans have another indicator going in their favor – the “battle of the primary ballots.” Two years ago, the Democrats had a big edge in presidential primary turnout, a reflection of the “enthusiasm gap” that benefited them from the start of the year to the end. This time, however, it is the Republicans who have the most energy. This is evident not only in polling data but also in the GOP’s lead of more than 3 million votes over the Democrats when comparing the number of ballots cast in each party’s primaries through the end of August. But this year, the primary ballot measurement could be a two-edged sword. The Republican advantage was built in many states on the excitement generated by newly activated legions of populist conservatives against choices favored by the Republican leadership. That infighting should not deter the GOP this fall in the anti-Democratic environment of 2010, but it could pose a critical problem for the party beyond November as it seeks to refurbish its “brand” for 2012. One thing for certain, this year is a far cry from 2008. Then, the historic nominating contest between Obama and Hillary Clinton brought nearly 37 million voters into the Democratic presidential primaries, compared to less than 21 million on the Republican side. 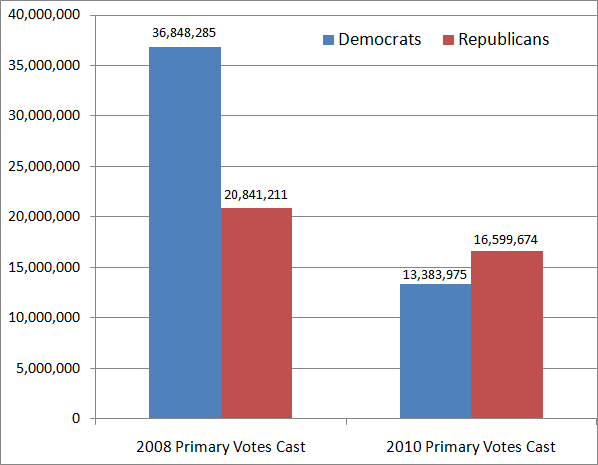 Of the 40 states that held presidential primaries in 2008, more votes were cast on the Democratic side in 33 of them. This year, the numbers have basically reversed. Almost 16.6 million votes have been cast in Republican primaries thus far, compared to less than 13.4 million in Democratic contests – using the statewide race (governor, Senate or House at-large) in each state that drew the most votes and had a tally on both the Democratic and Republican sides. Of the 36 states where such a count has been available in 2010, more ballots were cast in the Republican primary in 23 of them. The states where more voters picked a GOP primary ballot comprise an eclectic group. It includes not only traditionally Republican states in the South and the nation’s rural heartland, but also some major battleground states such as Florida in the South, Michigan and Missouri in the Midwest, and Colorado and Nevada in the West. Even in parts of “blue” America, the Republicans have finished on top this year in the battle of the primary ballots. One such case is Washington, where candidates of all parties ran together in August on a “jungle” ballot. There, in the race for the U.S. Senate, more votes were cast for Republican candidates than their Democratic counterparts – a group that included the incumbent, Patty Murray. Often the party that wins the most total votes in the year’s primary elections goes on to have a very successful general election in November. That was the case in 2008, when enthusiasm was on the Democrats’ side from the beginning of the year to the end. Nearly two thirds of all presidential primary ballots were cast in the Democratic contests that year, en route to decisive presidential and congressional victories for the party that fall. However, in 2010, the energy has switched to the Republicans, which has been reflected in a GOP advantage over the Democrats of more than 3 million votes headed into the final round of primaries this month. Notes: The 2008 vote totals are based on results from presidential primaries in 40 states and the District of Columbia. The 2010 totals are from primaries in 36 states that were held before the end of August. Another eight primaries are to be conducted in September. This year’s primary vote is based on the statewide race that had the largest number of ballots cast – between gubernatorial, Senate and House at-large contests (in states where there is a single congressional district). States are not included where none of these contests had a vote tally on both the Democratic and Republican sides. A plus sign (+) indicates the party that received the most votes in the primary season. Sources: America Votes 28 (CQ Press) for the official 2008 presidential primary vote totals; the web sites of state election authorities for 2010 primary turnouts, with the results based on a combination of official and nearly complete, but unofficial, returns. Stop here and the situation looks quite rosy for the Republicans. But there is another side to this story and it is much more ominous for the GOP. A significant part of the Republicans’ primary turnout advantage in 2010 has come in states where “anti-establishment” candidates have fought the party’s traditional power structure. In Arizona, Sen. John McCain lost nearly 45% of the Republican primary vote to a pair of anti-establishment candidates led by former Rep. J.D. Hayworth. Together, the vote for McCain’s challengers (almost 220,000) was nearly as large as the total number of ballots cast for the entire field of Democratic Senate candidates (less than 250,000). In Colorado, the number of votes received by Republican Senate nominee and “Tea Party” favorite, Ken Buck (210,000), was greater than the total for any candidate in the Democratic Senate primary in Colorado. That includes the party’s Obama-backed nominee, incumbent Michael Bennet (who drew less than 185,000 votes). In Kentucky, another “Tea Party” favorite, Rand Paul, trounced the choice of Senate Minority Leader Mitch McConnell in the Republican Senate primary, in the process drawing more votes (greater than 200,000) than McConnell himself had received in winning renomination in 2008 (less than 170,000). And in Texas, two-term Gov. Rick Perry effectively painted himself as an anti-establishment politician to win renomination. He portrayed his major Republican primary foe, Sen. Kay Bailey Hutchison, as a Washington insider, won the support of Palin, and even raised the specter of Texas seceding from the Union. Perry’s victorious primary total of more than 750,000 votes surpassed the number for the entire Democratic field of gubernatorial candidates (680,000). In short, large primary turnouts can be the product of greater energy and enthusiasm within one party but it can also be fueled by the passionate feelings let loose by friction between different elements within the party. This year, the Republicans have both. The infighting should not hurt the party’s chances this fall, as both the GOP establishment and its agitated, conservative activists are dedicated to defeating Democrats. But in 2011 and beyond, the impact on the party may not be so positive. The potential downside for Republicans in their high-turnout primaries this year is that a number occurred in places where the activist conservative wing of the party successfully took on the choices of the GOP leadership. Below is a sampling of such contests. The list includes two-term Texas Gov. Rick Perry, who was able to portray himself as an “outsider” against veteran U.S. Sen. Kay Bailey Hutchison. Note: A plus sign (+) indicates the party that received the most votes in the primary. Source: The web sites of state election authorities for 2010 primary turnouts. They are based on a combination of official and nearly complete, but unofficial, returns.